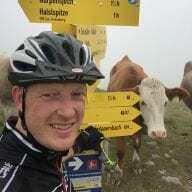 I was once in a group ride and struggled to remember exactly what the advertised route and pace was. That made me wish for a way to see the event description even after the event has started. This was the original idea that lead to the event list you find at ZwiftHacks. 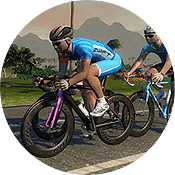 By now Zwift has 500+ upcoming events in the event module. 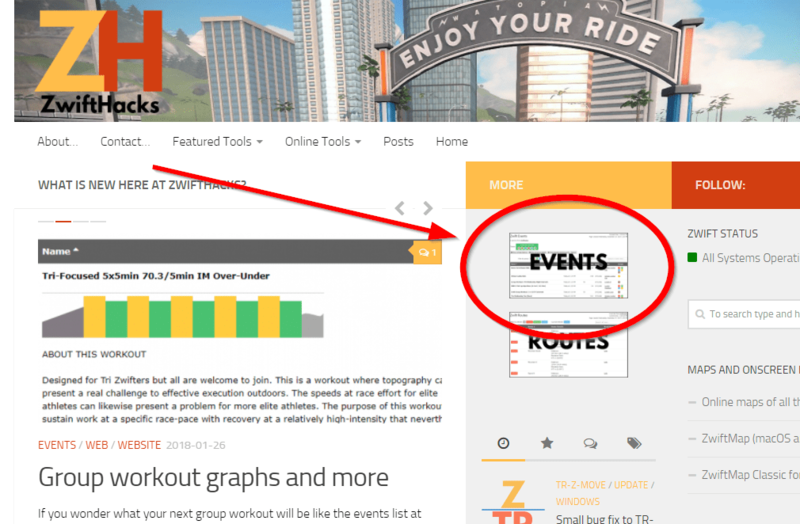 Scrolling through the list in Zwift Companion or on zwift.com is not always the easiest way to find your next event. This is where ZwiftHacks hopefully helps. What are the features you can use? 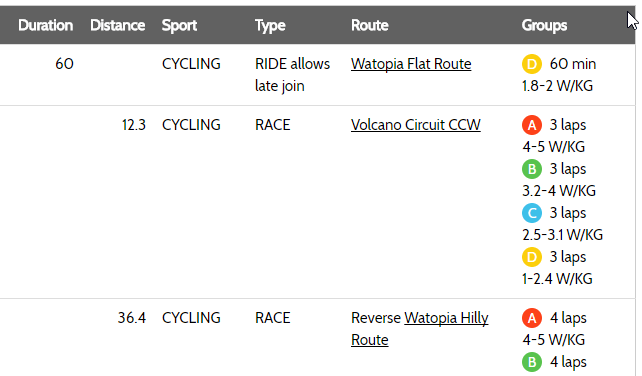 The data in the event list comes directly from Zwift. 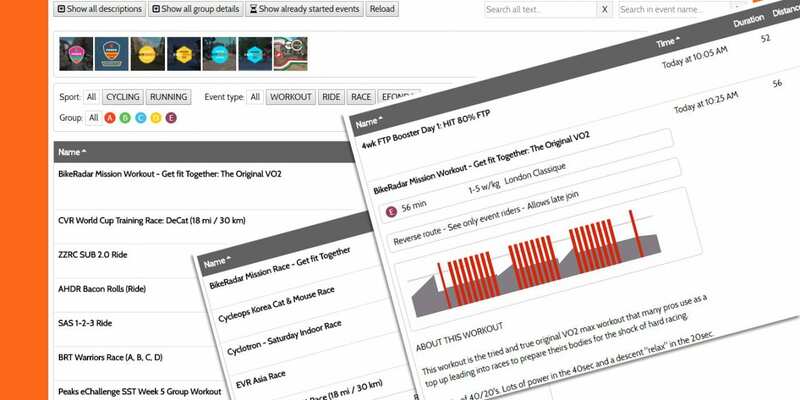 It is the same event data which Zwift presents in its own event list. The focus here has been on features that make it easy to search, filter, and generally get as much information as possible without scrolling and paging a lot. You can read a lot of detail for multiple events straight from the list. The full description of an event appears when you click the event name. You can also toggle all descriptions at once with the ‘Show all descriptions’ button. There are buttons for quickly filtering the list down according to your interests. Most group rides and some of the group workouts let you join after they have started. The event list tells you which ones. Does it matter if you can see other riders during a race or ride? The event list tells you both in the ‘Type’ column and in the event description. The route name is a link to more information about the route (the ZwiftHacks route list). 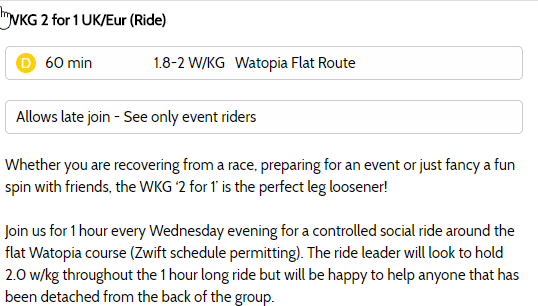 In it you will also find a direct link to Zwift Insider’s description of the route. If the duration/distance of an event is based on a number of laps the corresponding distance in km is shown. Click in the Groups or the Name column to see the information. You can also just press ‘Show group detail’ to expand the entire Groups column. You can link directly to a custom search by adding a filter parameter to the URL. 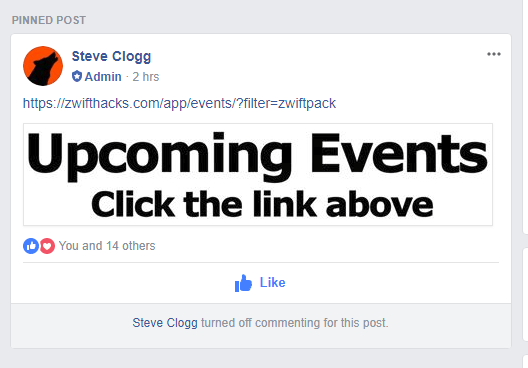 As an example Zwift PACK has a link directly to its events in the pinned post in its Facebook group. 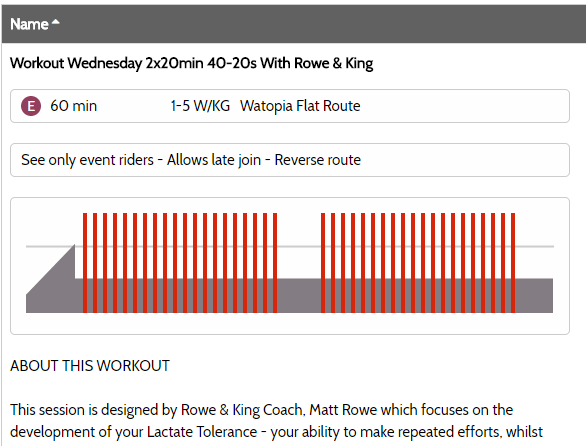 For the group workouts there is a graph showing the workout in the event description. What is the next event for you? There are plenty of events to pick from and hopefully the Zwift Hacks event list helps you find just the right one. Share how you find the best events in the comments – or pick an event and ride your bike! Showing what has already started would be a big help. BUT, since I am using IOS nothing is going to help. Great idea for most! What do you mean when you say ‘nothing is going to help’ ? I am just being curious. Outstanding stuff and much needed, thanks! I see it’s already already been added and very useful too, many thanks! OMG I love this. Thanks for the hard work!!! Looks great… will give a try. 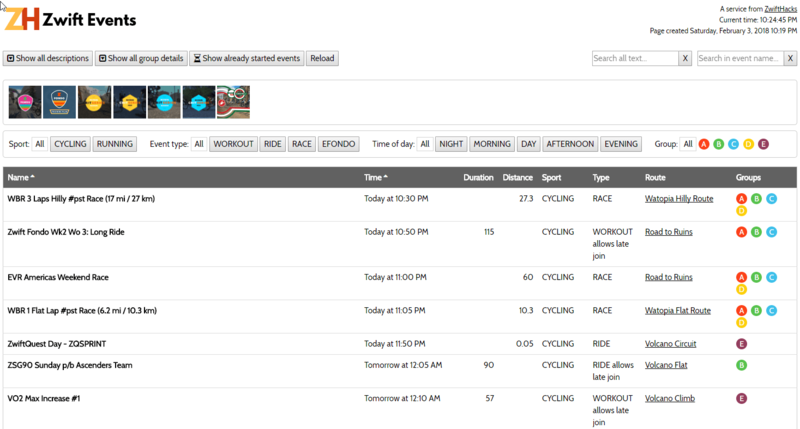 Just a suggestion but could it recommend a race category based on the time and riders FTP. Understand you’d need to work out the race distance and elevation profile and convert that to a time (somehow) then scale the FTP appropriately and see which w/kg bucket that falls into. Obviously there would be a bunch of assumptions so it could only ever be a recommendation but there’s a lot of angst about people entering the wrong category, yet no tool to help them select the right one. Thanks for your suggestion. This would be a bit tricky to implement, but the idea goes into the collection of things which I maybe will take a shot at sometime. Biggest barrier to people selecting the correct bracket (other than a minority who fancy racing down) is getting through the pain of an FTP test in the recent past! Well, it really wasn’t but a quick fix helped. Everything should be fine now.